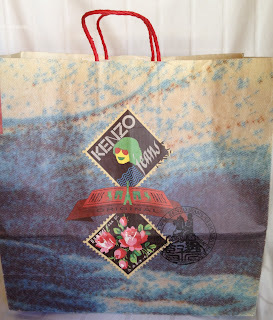 Back in the 80s, French Elle, which I used to read the way divinity students read the bible, was featuring a lot of Kenzo-designed clothing, so needless to say, the boutique was high on my list of things to do when I got to Paris. A few weeks into my trip, after spending the better part of a freezing cold, rainy JULY day, looking for a laundromat with functioning machines, I decided that instead of cleaning my clothes, a much better and infinitely more exciting option would be to just buy new ones. Not realizing that this was the start of the famous twice-yearly Paris sales season, I headed to Kenzo to find roughly half the world's female population slugging it out over scarves and kaftans. Somehow I managed to wrangle a pair of jeans out from someone's hands (although she was ultimately unable to prove that in court) and bought them for the equivalent of $40, which was an astounding amount of money for me back then. I can't tell you how heartbroken I was when, on Bastille Day, just trying to celebrate the liberation of a people with whom I feel an unhealthy level of kinship, I fell and ended up with a big, gaping hole in the right knee. Vive la France indeed.